Thought it might be fun to post a technique every Tuesday. This will force me to find a new technique every week. This week, the technique is chalking over Versamark. I couldn't find any pictures online to use, so my 9 yr old took some pictures of me demonstrating. I always think it is easier to figure out with pictures! 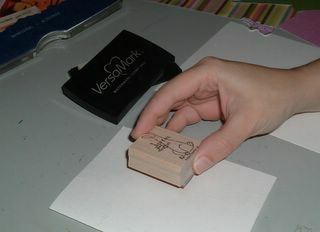 Step 1: Stamp your image with Versamark Ink. Here, I am stamping with a Birthday Bunny from the Birthday Banter set. You can also use a Versamark pen and write a greeting. 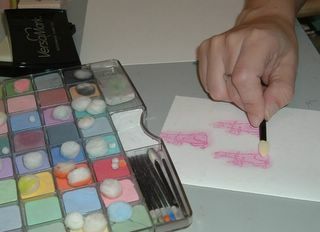 Step2: Chalk over the Stamped images and the Bunny magically appears! You can use various colors or just one, your choice. With large background stamps the rainbowed colors are a nice affect. Step 3: If it is a card, you should probably seal it, so it doesn't come off on the reader's hands. 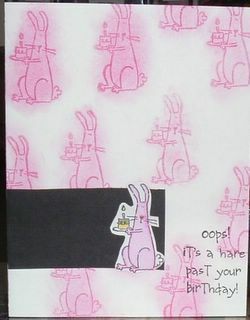 Voila...My little bunny card.